Whether you've got a party to plan in a few weeks or a few months, it's never too early to start making your plans! The ChicagoKids.com party guide makes it easier for you to find all the right options. From Party Locations to Party Entertainment to Party Rentals & Supplies, you'll find great ideas on ChicagoKids.com and hundreds of resources in our Party web site, Basharoo.com! Here are some great options to consider for your next party! Visit our latest blog post to see some of our top picks! Celebrate your Birthday in Culinary Style! At Taste Buds Kitchen, budding chefs turning 3 to teen work with our extraordinary instructors to whip up culinary masterpieces from scratch. Our parties are part kid fun and part chef's technique. We reserve our entire kitchen studio just for you and take care of all the details so you can sit back and enjoy. Popular themes include Around the World, Battle Cupcake, Pizza Perfection, Tea Party, Chocolate Lovers, Mystery Basket, Pasta Wars, and many more! We are the premier culinary entertainment experience for kids, families and adults. We host cooking classes and events for ages 2-99 in our bright and spacious kitchen studio that's custom-designed for kids by day and is adult BYOB by night. Mobile music and dance parties for 1-6 year olds! It's party time! Kid Rock 'n' Roll music and dance interactive parties are for children 1-6 years! We take our fun on the road and bring the party to you! During our 45-minute program, your party guests will have a blast with our kid-friendly rhythm instruments and movement props, and will participate in a musical parade, parachute games, a freeze dance, a balloon drop, and much more! From toddler songs to the most current dance songs for little ones, we have it all! Wiggle, giggle, dance and play! Imagine a memorable, stress-free party where both kids and parents will have an amazing time celebrating and playing together. That's what you get when you host a party at DuPage Children's Museum! Create a work of art in The Studio, build with real tools in the Construction House, make a splash in AWEsome Water, and let your imagination run wild in Creativity Connections. With over 17,000 square feet of exhibit space to explore, the possibilities are endless. Party packages include UNLIMITED Museum playtime before and after reserved time in a private party room, with other options to customize your experience. Explore, create, build, wonder, discover, think, play, and more... Every party is an adventure! The Little Beans Cafe birthday experience will be the most fun party in town for both kids AND parents. We fulfill all of the desires and wishes of our birthday boy/girl to make the party a birthday celebration they'll never forget. Specific birthday party questions can be sent to ashley@littlebeanscafe.com or you can call our party line at 773-490-1037. Join the Circus for your next Birthday Party at CircEsteem! Our two-hour Circus Party is led by 4 instructors from our professional staff and Advanced Performance Troupe. The party includes warm-up games, an exciting demonstration of the chosen skills, a circus workshop with hands-on instruction, and time for food, dessert and presents. Adults not participating in the circus workshop are free. Parties can be held at our location, or we are happy to bring the circus to you! LEGO THEMED PARTIES TO GO - You provide the location, we provide the fun! Want to have the best birthday party ever? Let us help you create the perfect birthday celebration for your child and their friends! Snapology of Chicago provides parties to-go at your home or any location within the City of Chicago and surrounding areas. Choose from many popular themes, such as LEGO City, Star Wars, Superheroes, BattleBots, or we will be happy to work with you to customize a theme of your choice. All Snapology parties include age-appropriate building challenges around your chosen theme, using LEGO bricks and/or DUPLO blocks and a special gift for the birthday child. A dedicated Snapologist will do all the work of providing the entertainment so you can enjoy your child's special day. 872-529-LEGO (5346). Plan Your Perfect pARTy at The Paintbrush! Easy... Stress-free... We do all the work! Small group or big bash, our birthday pARTies are great for children of any age! We customize your intimate pARTy to make it age-appropriate to your group with art exploration, an artist lesson, guided art project and celebration time. Relax while your child and their friends create and celebrate. We take out all the stress of planning your child's birthday pARTy. You're not renting a space, you're hosting a customized pARTy. We take all the guesswork out and provide our own unique pARTy experience! Choose the best celebration for your child! 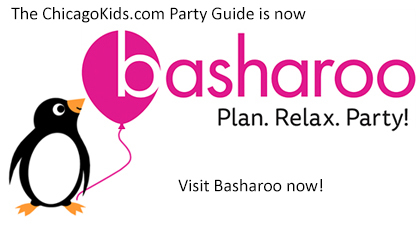 Find a full range of options on our party web site, Basharoo.com!